This morning on board the Cetacea we began our search towards the middle of Stellwagen Bank. During our search, we communicated with other whale watch captains who were searching further North. Unfortunately, we both were coming up short. We decided to turn towards the SW Corner of Stellwagen. Luckily, because of the great visibility today, we were able to spot the tall, column-shaped blows of a pair of finbacks. The area was jam-packed with not only fishing gear, but also lots of fishing boats and of course at least 100 tons of finback whale (finback whales can weigh 50-60 tons each)! Once we got a little bit closer to these two animals, I saw something that I never thought I would see before…a finwhale pectoral flipper! I was a bit stunned by this and failed to make a big deal out of it in fear that my eyes were playing tricks on me (I lacked a photo to prove it)! On the return trip a nice fellow was happy to show me a photo that he got of this strange phenomenon and I was overjoyed! 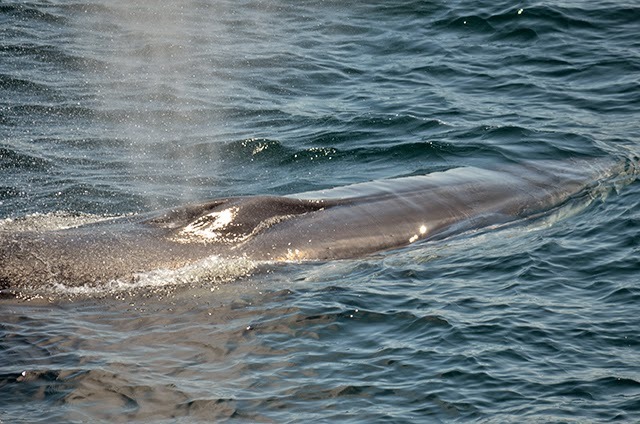 Throughout the trip, this pair of finwhales continued to constantly change direction and resurface rather quickly. They were likely actively feeding. There were tons of birds in the area this morning following these two feeding finbacks around including many varieties of shearwaters and gulls! It was a great trip! This afternoon we ended up whale watching just a mile off of Racepoint Beach in Cape Cod! Aside from a brief look at a minke whale, we spent most of our time with massive finback whale (a different individual from our morning trip). This whale was likely feeding and changed direction very frequently. There were a few nice surprises throughout our trip as well. First of all there were quite a few seals in the area! 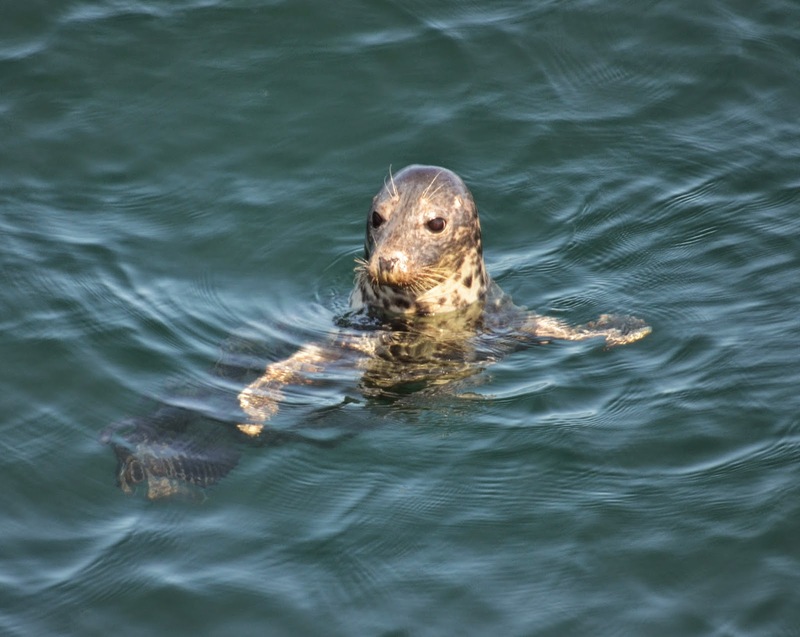 We saw 3-4 gray seals and even a couple of harbor seals! They were popping up left and right this afternoon and it was very easy to spot them on the glassy water! Another great surprise was that there were a few dolphins making their way through the area! Captain Tim has a very keen eye and spotted them about a half-mile away. 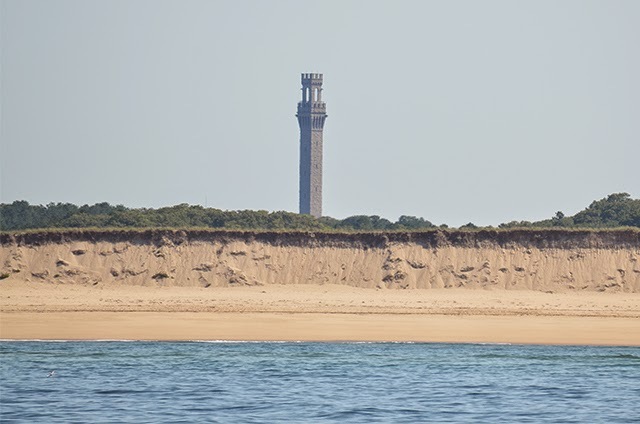 Unfortunately there was too much boat traffic in the area to get a good look and determine the species, but it was nice to know that this area around the tip of Cape Cod is so productive. It was a unique trip and was definitely worth the trip. This morning of the 10am whale watch we headed south after hearing that the boats up north had come up empty handed. Near the southwest corner we picked up a fin whale that was taking long dives and travelling north, not the direction we wanted to go, so we continued on to the southwest corner. Once there we found several fin whales in the area and spent most of our trip with a pair of fins that were taking slow 3-4 minute dives and spending a lot of time at the surface. 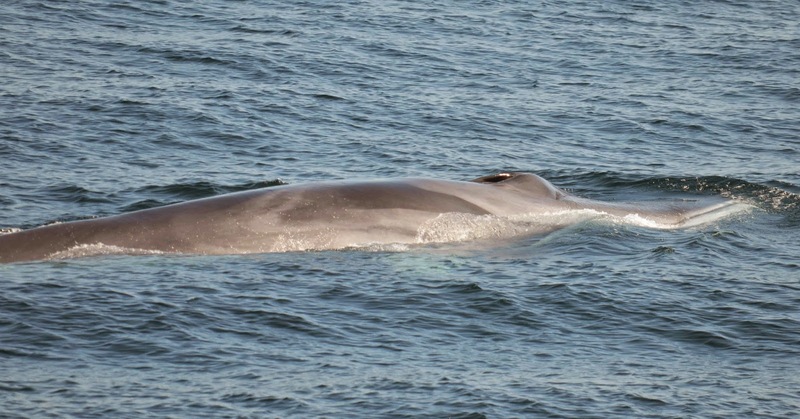 The close looks especially allowed us to see the unique patterning that fin whales have which we call the ‘chevron’, a swirl of darker grey and tan pigment located over their shoulder blade which we can also use to identify individual whales. 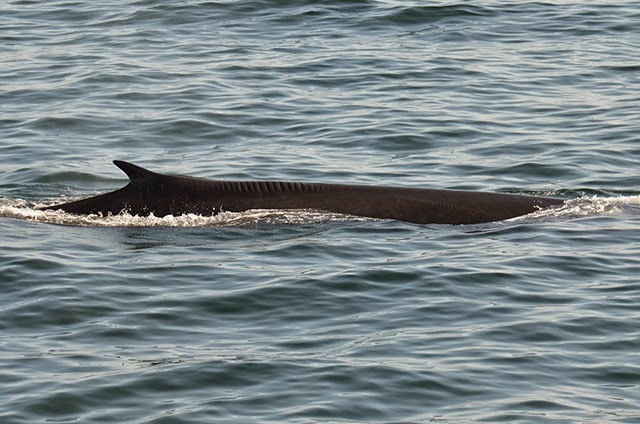 We also got to see the lovely long rostrum or head of the fin whale which some researchers say looks a bit like a duck’s bill and the interesting splash of white that fin whales have along the right side of their bottom jaw. It was an especially special trip with these whales. On the 3pm trip we again headed south but this time headed even further south along the beach at Race Point. It was a special opportunity for me to actually have some scenery in the back of some of my photos! In this area we found four fin whales and a number of grey seals. 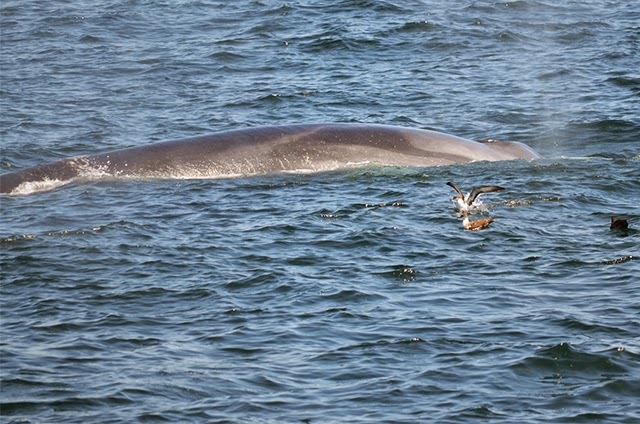 The fin whales were moving a lot more this afternoon and dive times were more erratic as was the direction of travel. We spent most of our time with two fin whales which spent about an hour associated with each other consistently surfacing and travelling together. We use the unique patterning of the chevron patter on fin whales to identify individuals but getting the photographs and being able to recognize these patterns is very challenging so we typically rely on other unique marks, usually scars, to identify individual fin whales. Some of this scaring, especially on the dorsal fin, can be natural but many more are from human impacts. After reviewing my photographs I noticed that one of the whales we watched most the trip has a very prominent series of parallel scars that look to be from a boat’s propeller. This type of scar is incredibly recognizable but are a sad reminder of our impact on these animals. There were also a lot of seabirds in the area, especially a large number of Manx shearwaters which are the first I’ve seen in a month or so! 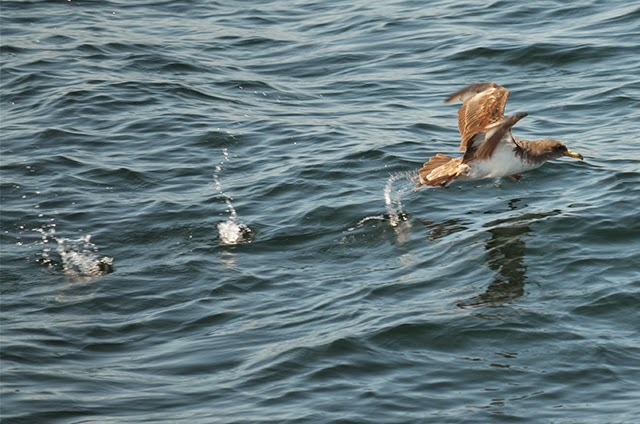 I also was very excited to spot a jaeger, a type of seabird, that harasses other birds into dropping the food it has caught. It was only the second time I’ve seen one but I wasn’t quick enough to get a photo! Today was a full day out on the water. For the 12:00 trip on the Aurora, Earl brought us close to the shores of Provincetown and the south eastern side of the bank. We saw about three minke whales and a few fin whales in the area. We had two amazingly close looks at a fin whale along our port side and a minke whale who crossed our bow and surprised passengers! 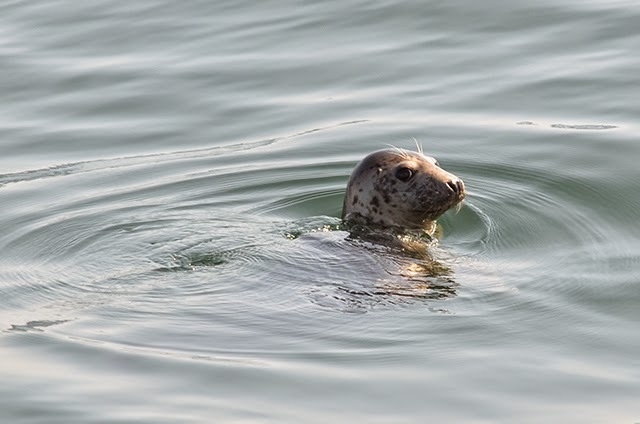 Then we had a very curious juvenile harbor seal who saw our boat from a distance and instantly headed directly towards us to take a look at everyone. 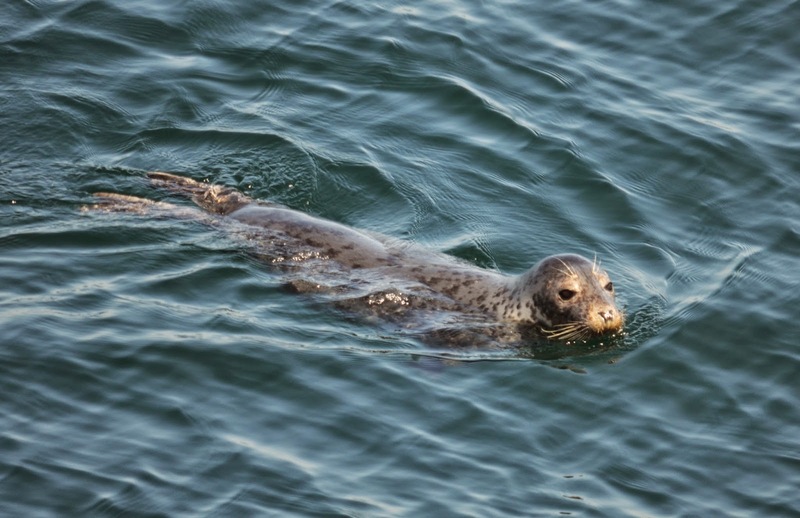 This was close-to-boat behavior at its finest and the harbor seal tried to engage with passengers, to the point where everyone was so entertained with this little seal that they stopped watching the whales! This was definitely the highlight of the trip and the best seal interaction I have ever had. 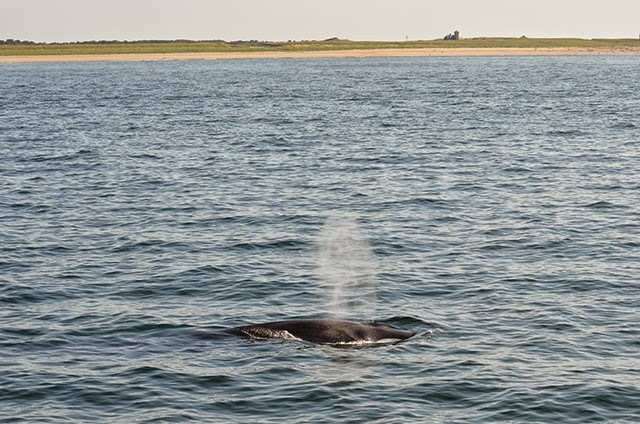 For the 5:30 whale watch we had reports of a handful of fin whales about a mile off of Provincetown, so we headed back down south. We found 2 separate pairs of fin whales and at least 6 harbor seals in the area. The seals were very entertaining as well, but not quite as curious as the juvenile from our previous trip. At one point we were about a half-mile off of Race Point and we could see people on land! 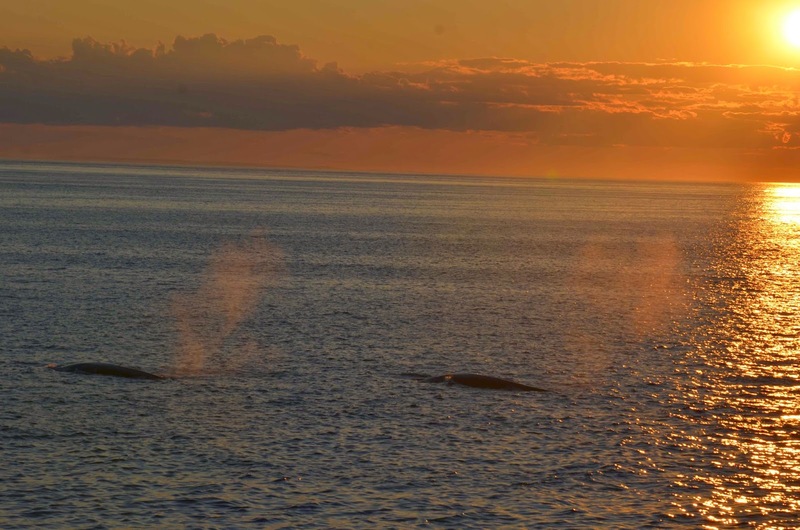 The fin whales were traveling and difficult to follow. 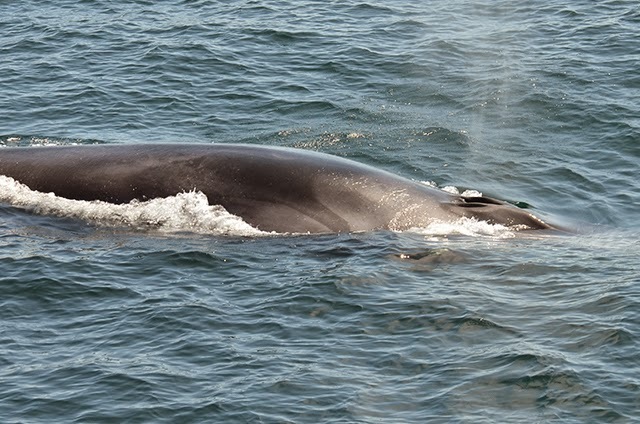 We also saw some minke whales during the trip that passengers were great at pointing out! We then had an exciting report of over 100 dolphins past the lighthouse going into PTown. We rounded the bend and sure enough there were North Atlantic white-sided dolphins everywhere! Some were jumping out of the water in groups and others will milling, but moving very quickly! We were also able to spot some calves in a nursery within the group. 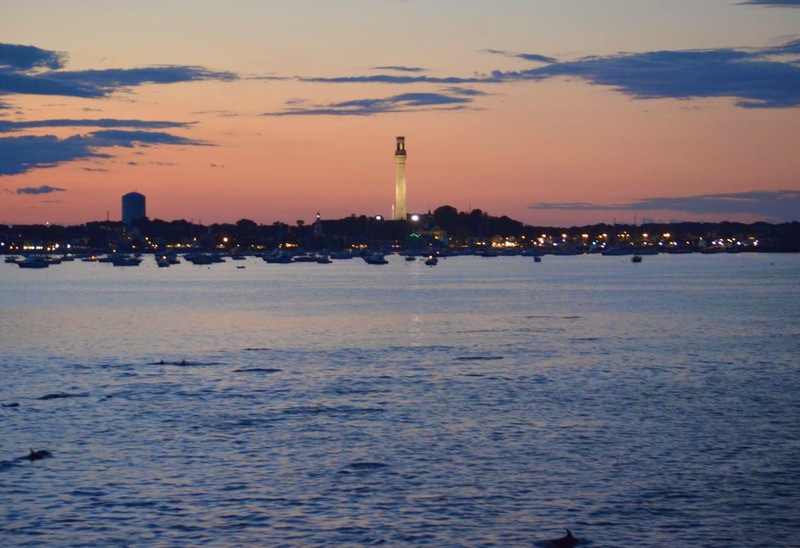 It was absolutely the most beautiful site to have the dolphins jumping into the sunset around the Provincetown Monument. And thanks to our captain Earl, it was one of most memorable experiences whale watching thus far!